We want to keep things moving and shaking here at Backcountry Skiing Canada so there is typically always some sort of competition running, or in the works. Have a read below to check out the comps and while you are at it why not enter? 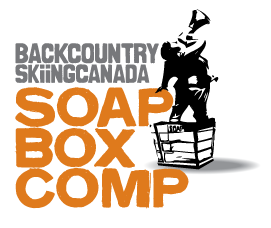 The "Backcountry Skiing Canada Soap Box Comp" is all about you and your stories. Are you a passionate and prolific pontificator of backcountry exploits? Then this season’s comp may be for you. The idea behind the comp is to get people to share their stories and build up the knowledge base that backcountryskiingcanada.com is. There are literally thousands of dollars worth of goodies to lay-on the lucky winners—$10,000 to be exact and 22 prize packs from brands you love. For full details on how to enter have a look over here. Backcountryskiingcananda.com and Rab have teamed up to keep the winter stoke afloat through the summer months. Get out and enjoy the backcountry over the summer by skiing, climbing, mountaineering or hiking with outdoor technical gear from Rab and participate in the "Backcountry Skiing Canada and Rab Summer Stoke Comp". The comp runs from May 1st - Aug 31st 2013 with monthly draws for incredible gear from our friends at Rab. Get the full details on how to enter over here.